One year ago, Delta Air Lines and Grupo Aeroméxico, S.A.B. de C.V. launched the first transborder airline alliance with antitrust immunity between Mexico and the United States. Since then, more than 7 million passengers have enjoyed improved connectivity, more convenient schedules and increasingly seamless service between the two carriers. Today, Delta and Aeromexico together offer more than 1,100 weekly flights on 64 routes between 10 cities in Mexico and 33 in the U.S. The partnership has launched eight new routes and two new joint destinations in Mexico and allowed co-location in nine airports in the U.S., six of which are Delta hubs, and three Aeromexico hubs in Mexico, making travel between the two airlines easier for customers. 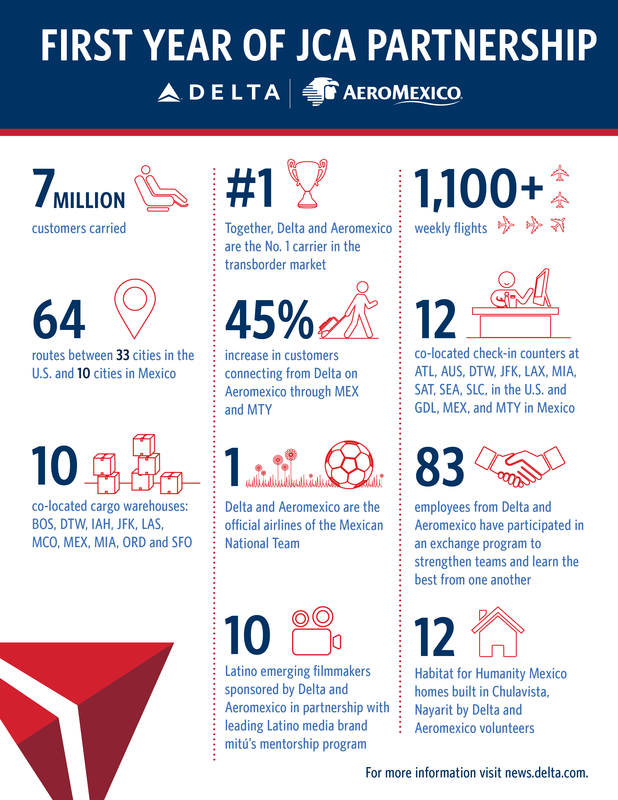 "Delta and Aeromexico are natural partners because we share the same values that put our people and our customers first," said Delta CEO Ed Bastian. "Our relationship is only getting stronger as we continue to roll out our industry-leading partnership, and customers of both airlines are seeing the benefits as we accelerate the pace in 2018." "This first year has been the result of an alliance that goes beyond improving connectivity for the transborder market, it has been about aligning actions and objectives to improve our customers' experience, while strengthening the bilateral relationship between both countries. We are very pleased with our results and we are certain that together we will continue to deliver the best service to our customers," said Aeromexico CEO Andres Conesa. New flights or additional frequencies launched include Los Angeles-Cabo San Lucas; New York JFK-Cancun; Detroit-Leon; Atlanta-Merida; Seattle-Mexico City; Atlanta-Queretaro; Portland-Mexico City; Los Angeles-Leon; Atlanta-Guadalajara; and Guadalajara-Salt Lake City. Capacity is up 11 percent*. Providing an increasingly seamless product to customers, Delta and Aeromexico have both rolled out branded products — a full suite of product experiences giving our customers a choice based on what they value on U.S.-Mexico routes. Together, Delta and Aeromexico opened a joint support center in Mexico to assist customers with connections and during irregular operations. Delta CEO Ed Bastian and Aeromexico CEO Andres Conesa received the BRAVO Visionary CEO Leadership Award for their strategic vision in 2017. *June 2017 vs. June 2018. The Delta Air Lines and Aeromexico joint cooperation agreement (JCA), creates an expanded transborder route network enhancing competition between the United States and Mexico. With up more than 1,100 weekly transborder flights, the airlines have added new destinations providing convenient schedules benefiting the customers of both companies, while deepening the relationship they have shared for more than 17 years as founders of the SkyTeam global airline alliance. Delta provides service in the United States through its connecting hubs in Atlanta, Detroit, Los Angeles, Minneapolis-St. Paul, New York-JFK, Salt Lake City and Seattle; and Aeromexico offers greater access to Mexico through its hubs in Mexico City, Monterrey and Guadalajara.